Thermal waters are a real miracle that our planet can offer us. People knew about the healing properties of thermal water thousands of years ago and created the first prototypes of modern spas called thermal resorts. Now they are presented with the whole modern complexes of various health programs for the body and soul. 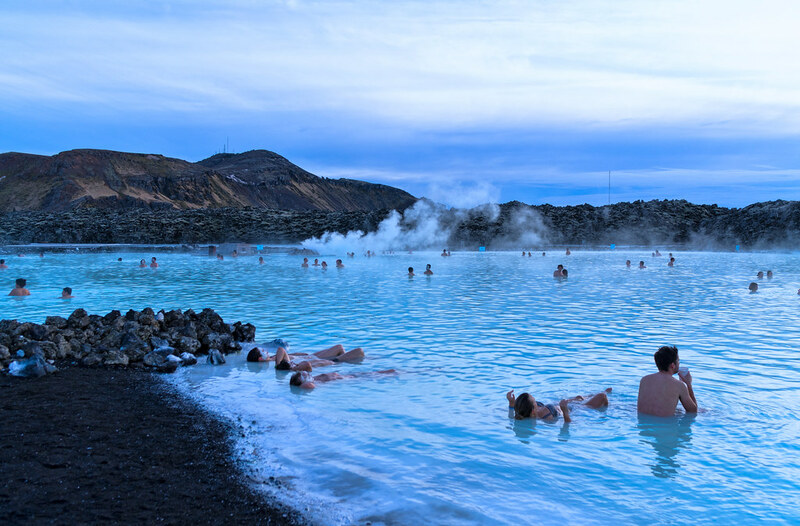 Blue Lagoon in Iceland is a famous geothermal complex located on the Reikjanes peninsula in the southwestern part of Iceland in Svartsengi. It was formed by the porous lava of an extinct volcano, but since lava is not a dense material with many holes, sea water can easily seep through it. Since the magma beds are located very close to the ground, the geothermal activity is extremely high there. The water temperature is kept at a level from +37 ° С to +40 ° С. During strong winds, the temperature drops, but not much. The composition of water in this source is 35% fresh and 65% sea water. Its special feature is that water is saturated with silicon, and sea salt, clay and quartz can be found in its depths. By the way, Blue Lagoon has its own clinic, which specializes in skin diseases. The price of admission depends on the season. 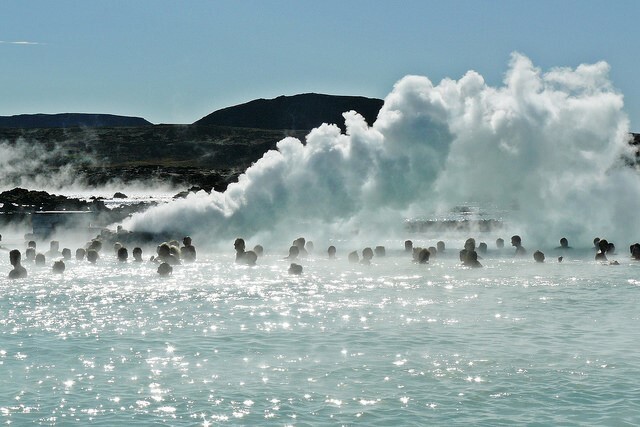 From September 1 till May 31, the cost of visiting the Blue Lagoon is 33 Euros for adults and 15 Euros for kids. From June 1 to August 31, admission for adults is 40 Euros and 15 Euros for kids. For children up to 13 years old, admission is free of charge. If you want to stay overnight, there’s a hotel on the territory of the geothermal complex. The cost of accommodation depends on the season and ranges from 190 to 280 Euros per night for a double room. The price includes breakfast and a visit to the Blue Lagoon. Valais is a famous thermal springs, located 200 km away from Zurich in the canton of Graubünden. 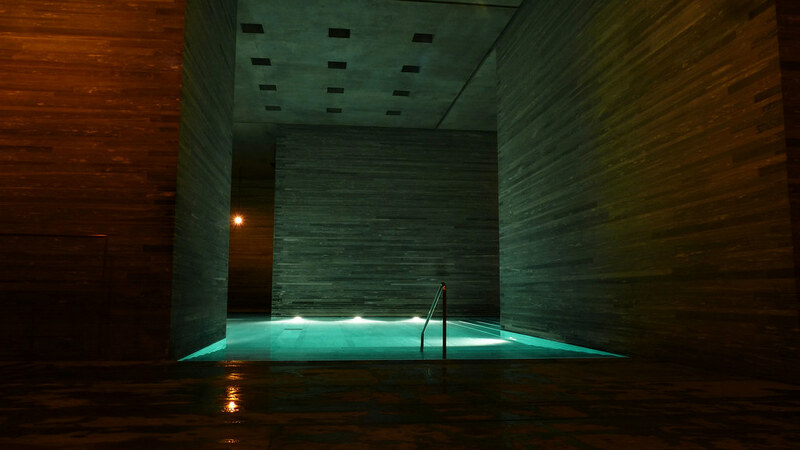 The architectural complex that was built here by Peter Zumthor, more than once became the winner of international architectural awards. For example, in 2010, it won the Daylight-Award, which is awarded for original and innovative use of daylight in architecture. Ancient sources, which push the water with the force of 400 liters per minute, are framed by baths decorated with gray-green quartzite. 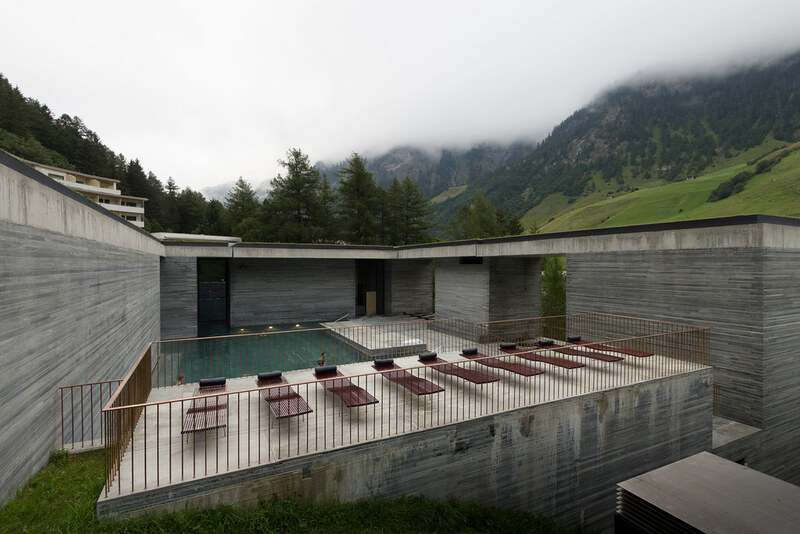 Grassy roof mixed with thin windows, gently illuminating the platform for swimming. Getting inside, it seems that time has stopped. Diving in the baths, the bathers swim through a small tunnel, which leads them into a pool with warm water providing a magnificent view of the mountains. The local thermal waters are rich in sodium sulfate and bicarbonate. In addition to the steam rooms, filled with the sounds of nature, a variety of pools is also striking: floral pool, hot and icy pool, black, and even sweet pool. If you want to stay longer in this magnificent place, stay in the local hotel. The cost of one night starts from 135 Euros. If you just want to visit thermal baths only, it will cost you 40 Euros. Budapest is known for its thermal waters. 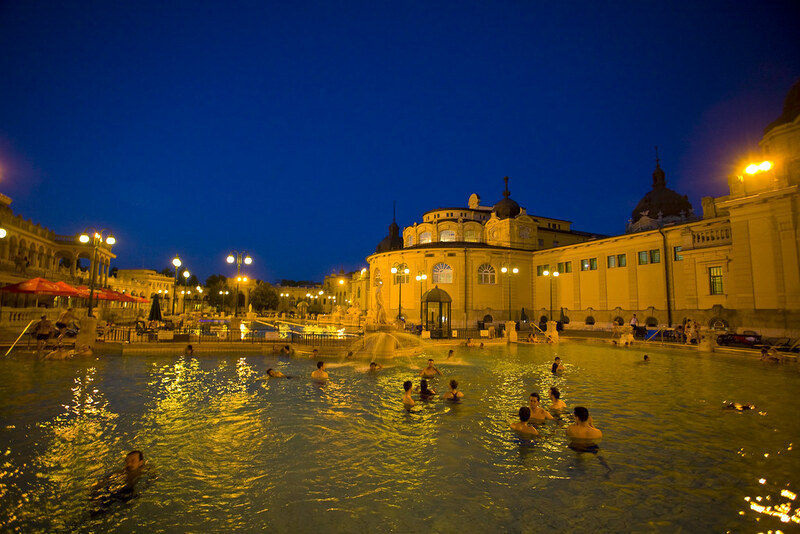 Szechenyi bath is considered to be the largest spa complex not only in Hungary, but also in Europe. 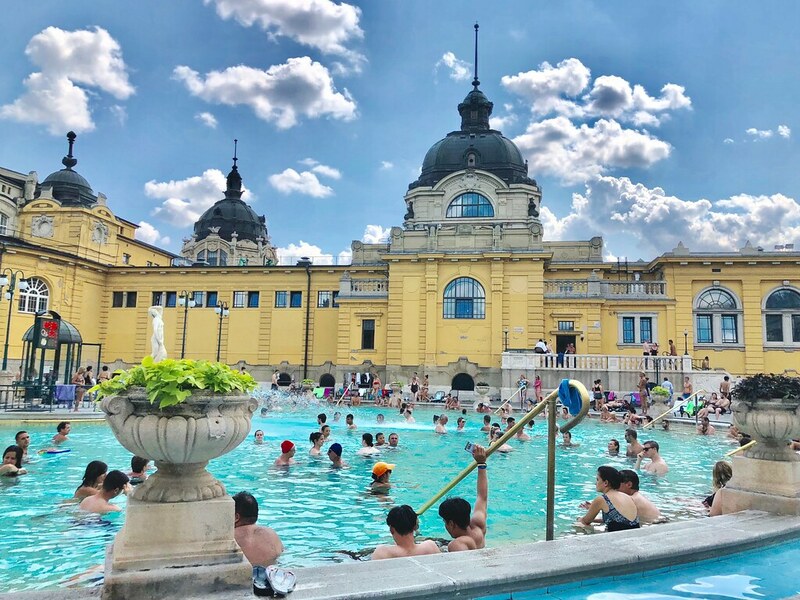 It’s very easy to find a bath in the city – Szechenyi is located in the City Park and when you see it, you think that this is some kind of palace. At the beginning of the 20th century, it was built by the architect Ede Dvorak according to the design of Gyazo Ziegler. The swimming pool got its name in honor of Count Istvan Széchenyi, a significant Hungarian politician and reformer. Initially, there was one well that was drilled in the 70s of the XIX century, and then in 1936 a second well was found, the temperature of which is + 77 °С and it’s the highest temperature among all the European thermal sources. Bathing in this thermal spring is recommended for those who have problems with the joints and the spine, neuralgia or lack of lime in the bones. People come there not only for medical procedures, but also for entertainment, because very often concerts of club music are arranged in Szechenyi. Totally, 27 baths operate in Budapest, and 13 of them are therapeutic baths. Therapeutic waters are used not only for swimming, but also for drinking. The water from the drinking source of the section contains calcium, magnesium, chlorine, sulfate, alkali, and significant amounts of fluoride. It’s assigned to those who have chronic gastritis, gastric ulcer, catarrh of the intestine, increased acidity of the stomach, chronic catarrh of the respiratory tract, metabolic disorders or diseases of the gall bladder. The entrance ticket costs from 12 to 17 Euros.